This is our baptismal font. Like almost all of the “pulpit furniture” it is removable. We can clear out everything up here, the chairs, pews, lectern, even the pulpit itself and the communion table. Sometimes we do clear it all out; for weddings, Christmas, special services, or whenever we just need the extra room. We pick it up and move it out, then bring it all back for the next Sunday. Everything always ends up back where it belongs. Well, everything except for the baptismal font. Somehow, the baptismal font doesn’t always make it back where it belongs. Sometimes it stays in the parlor, or in the hall closet. Usually it stays there until either someone notices that it’s missing or we actually need it for a baptism. Then we drag it back up to the front of the church. Until recently, the baptismal font had actually been out of the sanctuary for a long time. Maybe we moved it out for Good Friday? I don’t even remember. But it was gone until just a couple of weeks ago, when I got someone to help me find it and put it back where it belongs. It’s kind of sad that we so often don’t even notice when it’s gone. It’s sad because our baptismal font is a reminder of the beginning of our faith journey. At some point in our lives, almost all of us have received the waters of baptism. We have experienced baptism as the visible means of entry into the new covenant. Through our baptism, by the power of the Holy Spirit, we are united with Christ and cleansed by his saving work, we enter into the fellowship of the church, and are called to a life of faith and willing obedience. When we are baptized into the death of Jesus, we are buried with him into death; so that as Christ was raised from the dead through the glorious power of God Almighty, we too might be raised to live a new life. The words from our Baptism liturgy remind us that baptism is important, some may call it essential. It is when we rise up from death into life. Our baptism signifies the death of our old life, our old self, our earthly self; and the birth of our new life, our new self, our Godly self. When we are baptized, we go down in the water alone and we rise up with Christ. We go down and we leave the old and rise up to the new. We set our minds on things that are above not on things that are of the earth. Baptism is when we put to death whatever in us that is earthly; those desires of the flesh, like fornication, impurity, passion, evil desire, and greed. It is where we stop following the old ways, stop living the old life, and start following the new way. After we are baptized we live a new life. At least we do in theory. However since most of us were baptized as infants, and infants don’t engage in much fornication, impurity, passion or evil desire, ok, I guess that they can be pretty greedy, but otherwise there is not much about their old lives, their old ways, that needs to die. But adults, well, we are a different story. 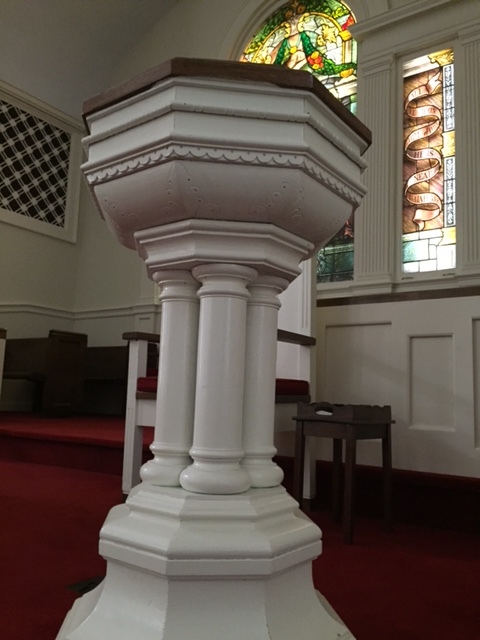 It is fitting that we keep moving our baptismal font in and out of the sanctuary. It’s sad but it’s fitting. Because we ourselves keep moving in and out of our new lives, we keep moving away from and then back to our new selves, we keep moving back and forth between earthly and Godly. We rise up and seek the things that are above, then we fall back into the things that are down below. While some of those earthly things, fornication, impurity, passion, evil desire, and greed, might not be much of a problem. Those other things that Paul writes about, anger, wrath, malice, slander, and abusive language; they are right down here with us when we fall back. We know that we are falling back instead of rising up whenever abusive language replaces praise; whenever slander replaces truth; whenever malice replaces benevolence; wrath replaces kindness; whenever anger replaces joy. It is important that we keep our baptismal font before us. We need it to remind us that we have stripped off the old self, with its practices, and have clothed ourselves with our new self, in the image of our Creator. It reminds us that Christ is in us and in all. This is a reminder that we all need. For far too often, especially lately, we have been falling down instead of rising up. We have not been seeking the things that are above, where Christ is. But we have been focused on the things that are below, where we are. We have been focused on what we want, what we need, what we desire. Rather than on what God wants for us, what God needs from us, who God desires us to be. We have forgotten that we have died to our old ways, to our old selves. We have forgotten that we have been raised with Christ, we have been raised to new ways and to live new lives. And it shows. It shows in the way that we have failed to strip off our old selves and clothe ourselves with the new self. It shows in the extremes of anger, wrath, malice, slander, abusive language. It shows in our lack of joy, kindness, benevolence, truth, and praise. It shows in our doubt, our mistrust, our selfishness, our anxiety, our fear. People look at us, and we look at ourselves, and do not see people who have been raised with Christ, who are seeking things that are above. Instead, they see people who are still dwelling below, clinging to our old lives and our old ways. It is time to for us once again strip off our old selves with our old practices, to die to our old ways. It is time for us to rise up into a new life and clothe ourselves in the image of our Creator. We need our baptismal font. We need it to be right in front of us. We need it to remind us of who we are, and who we are called to be. We need it to remind us that we are baptized into Christ Jesus. We are baptized into his death. We are buried with him through baptism into death, so that as Christ was raised from the dead through the glorious power of God Almighty, we too might be raised to live a new life. We need our baptismal font to remind us that we have turned away from sin, evil, and selfishness in our thoughts, words, and actions; and that we intend to participate actively in Christ’s church, serving God all the days of our lives. We need this baptismal font to remind us to rise up and live, not alone, not on our own, not by ourselves or for ourselves. We need it to remind us that Christ lives in us. And that the life we live now, we live by faith in the Son of God, who loves us and gave his life for us. Brothers and Sisters, it is time to go down into the depths of the waters. It is time to confess our sins; our anger, wrath, malice, slander, abusive language. It is time to acknowledge our lack of joy, kindness, benevolence, truth, and praise. It is time to repent from our doubt, our mistrust, our selfishness, our anxiety, our fear. It is time for us to be forgiven for our sins, and to have our old lives and our old ways die. Brothers and Sisters, it is time to RISE UP! to live a new life, where we seek the things that are above, where Christ is, seated at the right hand of God. It is time to RISE UP! to live a new life, a life filled with faith, with love, and with hope. It is time to RISE UP! to live a new life, a life where Christ is all and in all! It is time to RISE UP! to live a new life, a life turned away from sin, evil, and selfishness in our thoughts, words, and actions. It is time to RISE UP! to live a new life, a life that is lived by faith in the Son of God, who loves us and gave his life for us. Brothers and Sisters, it is time to RISE UP!